Now it's your turn! Make a project using the featured colors. 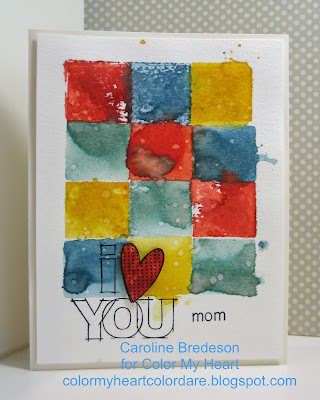 You do not have to use the Balloon Ride paper pack, and if you don't have the exact colors, just use the closest you have. 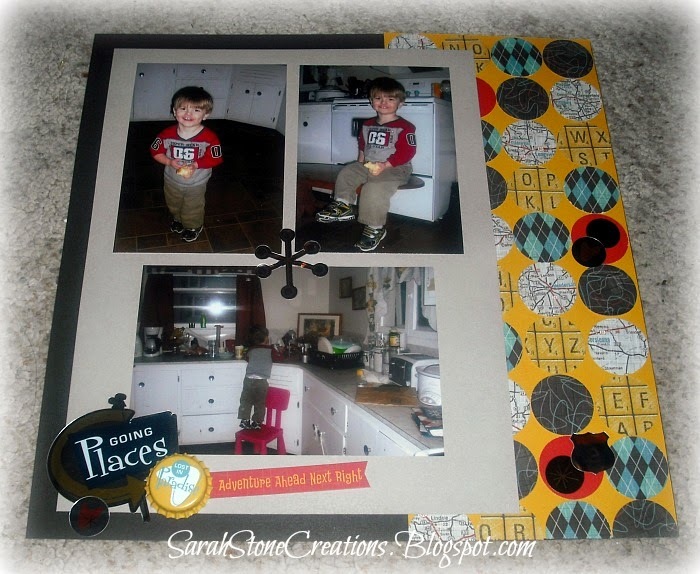 Take a picture of your project and upload it to your blog. Make sure you link to us in your post. Next, link your post up here. See our sidebar for complete rules. Don't forget to have fun! 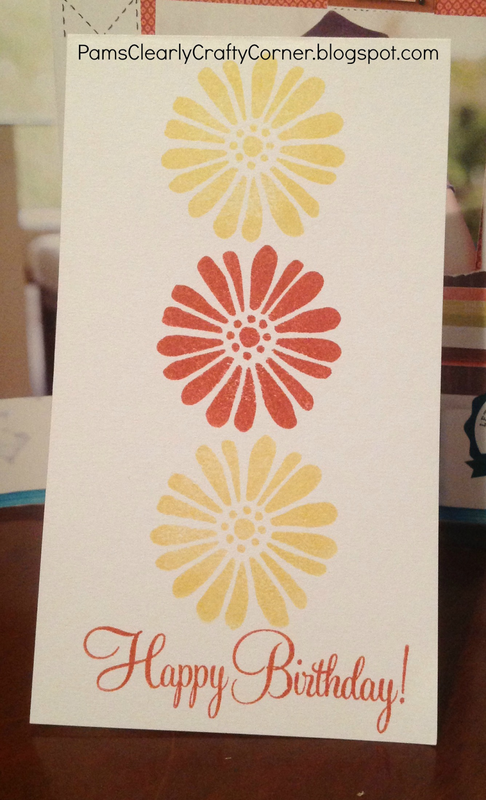 As a member of the Design Team, this was a hard week for voting on the winners in Color Dare #94 (Hollyhock, Buttercup). Thank you to all who joined us in the challenge! 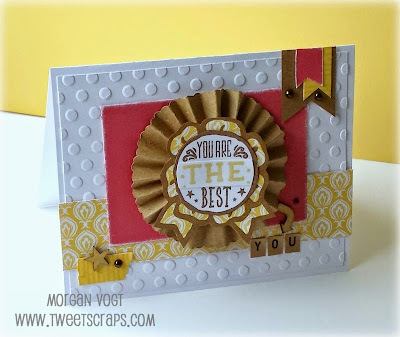 First we'd like to thank Morgan Vogt for being our Guest Designer for Color Dare #94 and sharing a wonderful project. 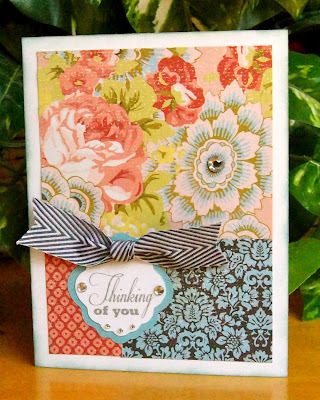 Our Diamond winner is Cat and her cute card full of textures! 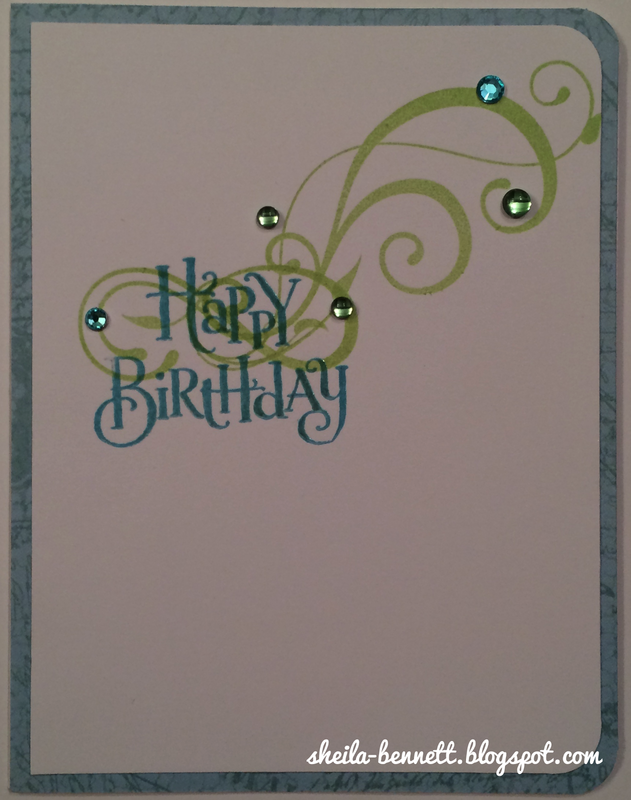 Our Emerald winner is Pam and the lovely and simple birthday card. 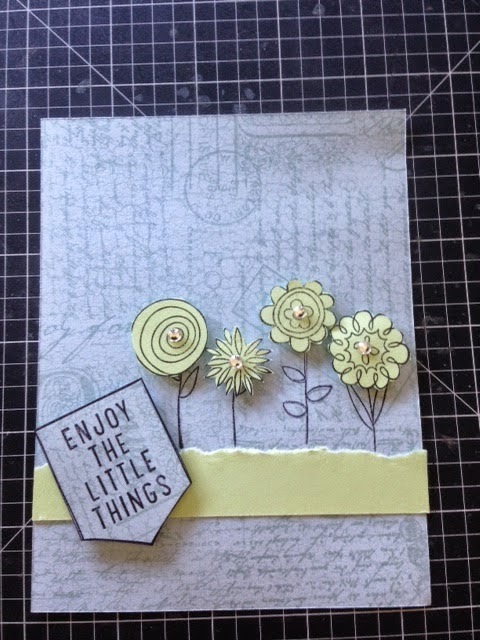 The Ruby winner is Debbie E and her beautifully simple design. 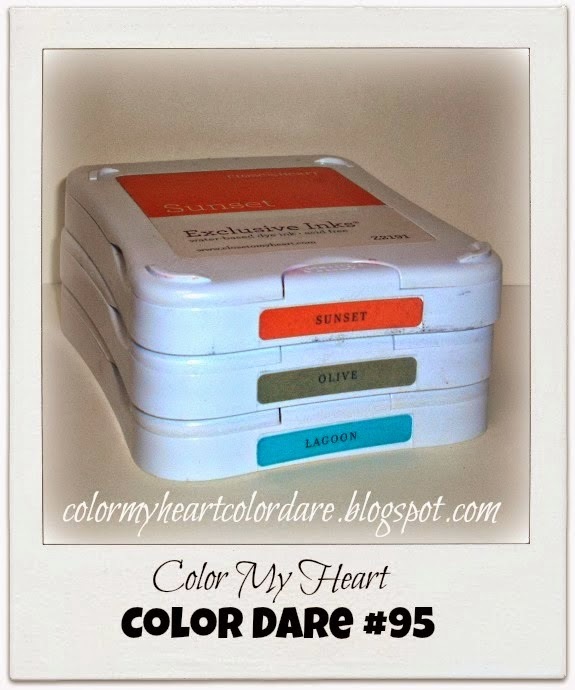 Congratulations to Cat, Pam and Debbie E for being the winners for Color Dare #94! Thanks for sharing your creations. Don't forget to grab your Winners Blog Badges from the tab at the top of this page. 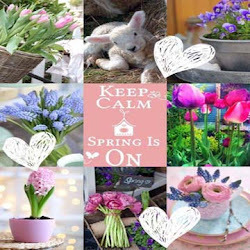 Be sure to check out all the entrants blogs for more great ideas! 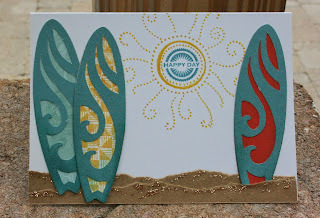 Don't forget about the Color Dare for this week: Sunset, Olive and Lagoon. If you don't have these exact colors just use something close. Neutrals are always an option to go with the Dare colors. 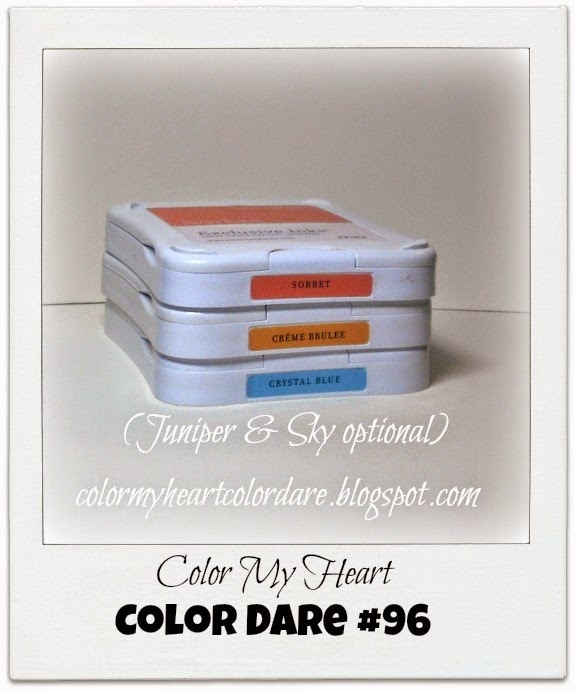 Color Dare #95 will be open until 8:00pm 9CDT) Thursday May 29, 2014. Come and join the fun! Sorry I didn't get this posted sooner. I had a mental block and forgot all about it! 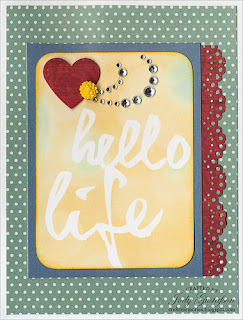 Color Dare Emerald Winner Jody with her fun card using this month's free downloadable images from Close To My Heart:. 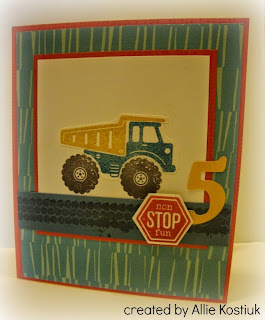 She has a series of 4 cards made with these images on her blog. Congratulations to Allie, Jody, Dawn and Christy--don't forget to grab your Winner's Blog Badges from the tab at the top of this page. 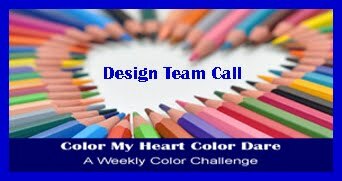 Here is a reminder about the current Color Dare --just two colors this week! 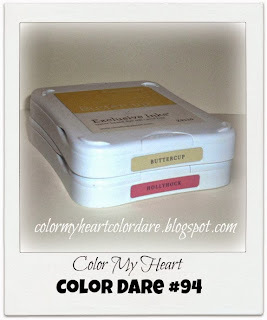 There is still plenty of time to join us in this week's color dare: #94 Buttercup and Hollyhock (if you don't have these exact colors it's ok to use something similar). 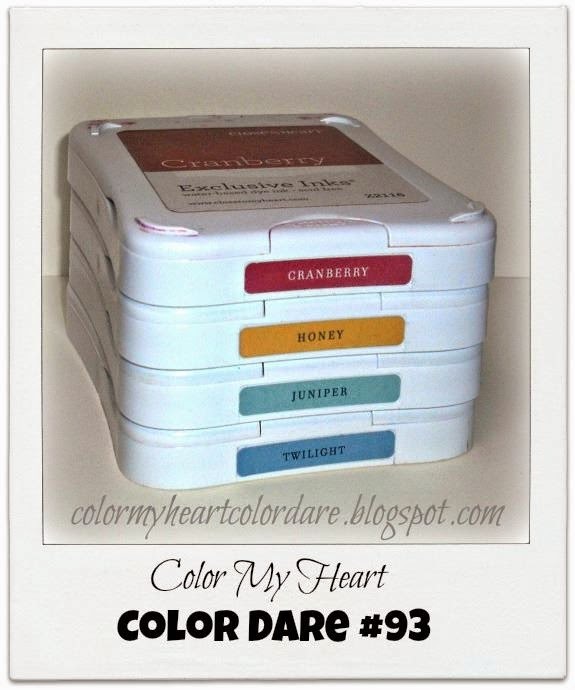 The color dare closes Thursday May 22nd at 8:00 PM CDT. Come and join the fun! I used the (very old) retired paper pack, Sonata, to make a layout of my kids. You can read more about it on my blog. #92 was a two color dare using Crystal Blue and Sweet Leaf. Thanks to everyone who joined us last week. You were all so creative! It was hard to chose winners but here we go! 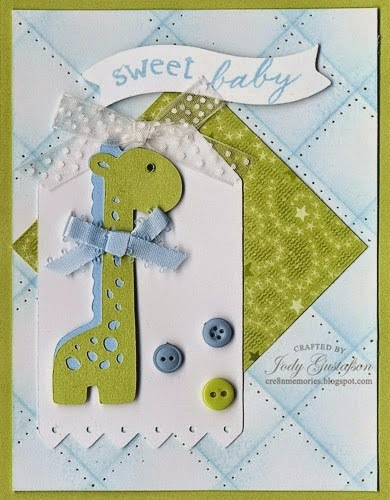 Color dare Diamond Winner: Jody and her adorable baby card. 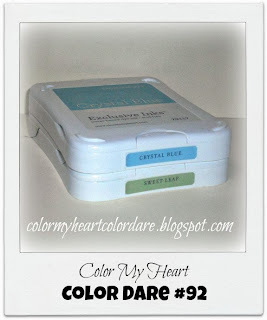 Color Dare Emerald winner: Sheila with her swirls card. The Color Dare Ruby winner: Judy and her cute flower card. Congratulations to Jody, Sheila and Judy! 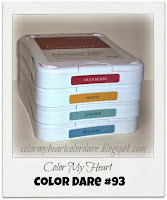 Be sure to collect your winner's badge from the "Blog Badges" at the top of the Color My Heart blog. There is still plenty of time to join us in this week's color dare: #93 Cranberry, Honey, Juniper and Twilight (if you don't have these exact colors it's ok to use something similar). 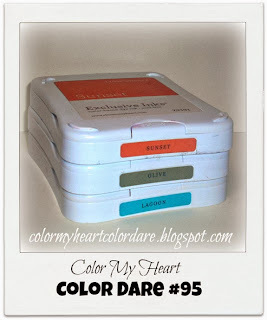 The color dare closes Thursday May 15th at 8:00 PM CDT. Come and join the fun! Greetings! Happy Friday! Here is a color combo for you... this is a nice bright one, so have fun with it! I made a layout using the retired Cruisin' paper pack with the level 2 foil complements. This is my 2 year old son here! Isn't he cute? 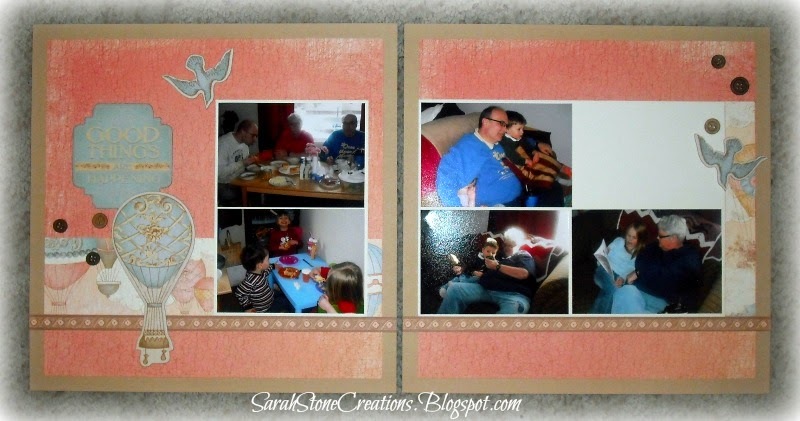 You can read more about this layout on my blog. The colors for Color Dare #91 were Ariana Coral, Ariana Green, Ariana Grey, Crystal blue and Outdoor Denim. 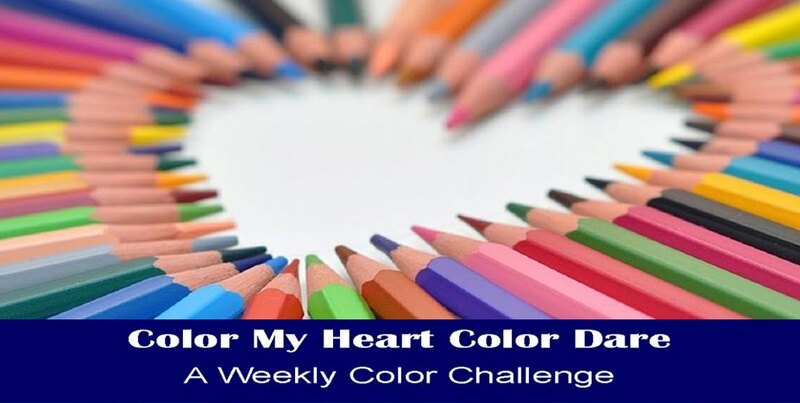 Thanks to all who entered last week--you all created wonderful projects with these colors and it was hard to select winners! 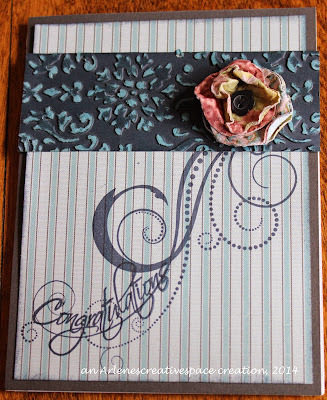 Color Dare Diamond Winner: Arlene with her fabulous use of the Blue Striped paper and fancy flower. 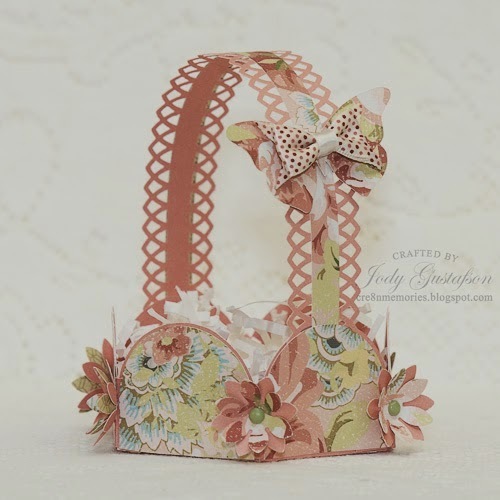 The Emerald Winner is Jody with her wonderful May basket with the ornamental handle and flower embellishments. What a terrific project! Congratualtions to Arlene, Jody and Shelly--please pick up your Winners Badge from the tab "Blog Badges" at the top of the Color My Heart Color Dare. There is plenty of time to join us for Color Dare #92! Colors are: Crystal Blue and Sweet Leaf. (If you don't have these exact colors it is OK to substitute similar colors.) The challenge closes Thursday May 8 at 9:00 PM CDT. We'd love to have you join us! And the APRIL winner is........JODY GUSTAFSON! 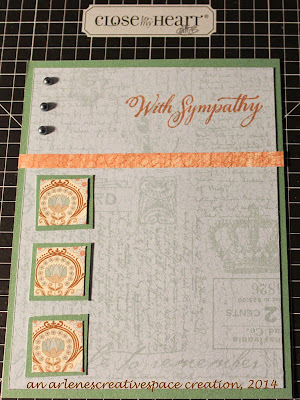 Please email me at stamplady@kc.rr.com with your mailing address and we'll send you a prize! #92 Crystal Blue and Sweet Leaf. Click here for details. *Monthly winners are determined from a random drawing using Random.org. I made a layout using a little of the old Cherry-O B&Ts. You can read more about it on my blog.